Great Scott was born on Look Sharp Farm in College Station, TX in 1990, making him 26. He was sired by Grundstein II and he is out of the dam Maui, a Rhinelander/TB cross that Marcetta and her husband, Don, purchased when Maui was four. Maui was undoubtedly the prettiest mare in Texas for many years. Marcetta has actually never competed Great Scott, although he was trained with help from Hans Biss, as a nice dressage horse. Scott was a stallion until age six, producing some 15 or so good quality riding horses. His wonderful personality has made him the love of her life. 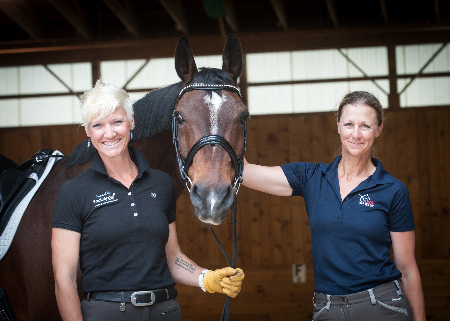 Back in the day, Marcetta competed on Maui and then on Gregor, purchased as a 17-year-old schoolmaster from Canadian Olympian, Lorraine Stubbs. 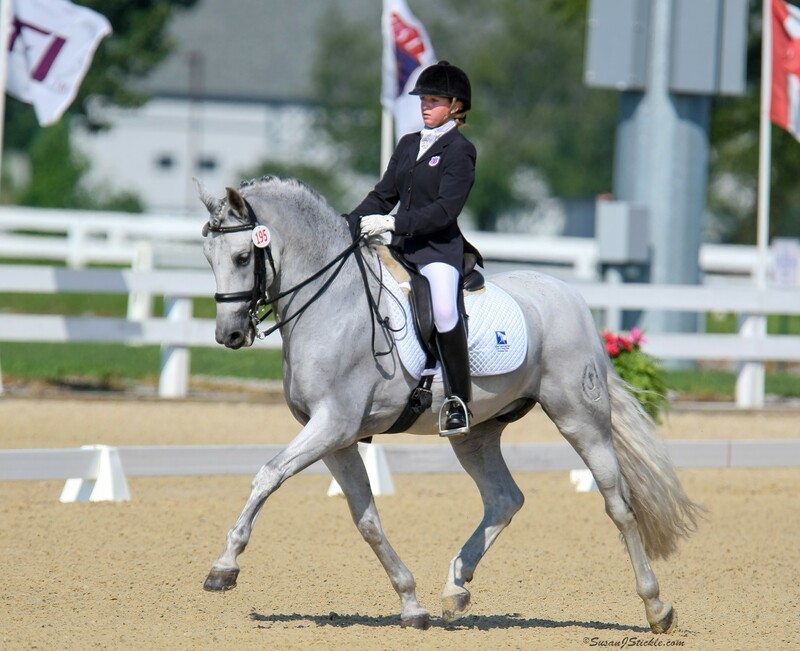 With Gregor’s help, Marcetta obtained a USDF Silver Medal. Gregor lasted until age 34, not quite long enough for a Century Ride on him. He and Maui rest in peace on Look Sharp Farm. Scotty doesn't do arena work anymore. He will trot and canter a bit when free or on the trail, but he has sat his hoof down about arena work. Therefore, Scotty and Marcetta performed the walk test at the show. 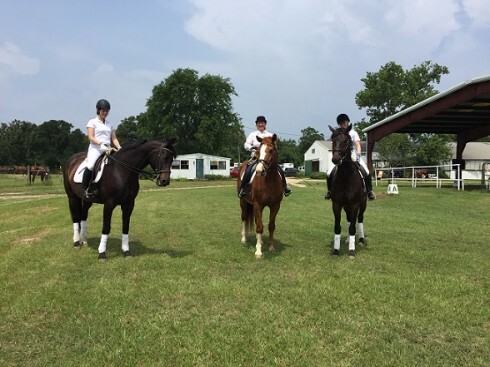 After their ride, two of Scott’s offspring with riders from Look Sharp, Jenny and Colleen, entered the arena for a musical freestyle presentation with Colleen riding Sir Ian Scott (Great Scott's grandson, age four and sired by Sir Donnerhall) and Jenny on Gwenael, age 20. (Gwenael is Scott's daughter, and Sir Ian's mother; she is Marcetta’s current mount.) The riders are local young women who have been with us at Look Sharp Farm for years. Our Sunday rides are typically on the trail or, on rainy days, quadrille-like in the arena. We thought it appropriate to show Scotty at what he likes to do now at age 26, i.e., walk, and also exhibit his legacy. Not to be forgotten in this family affair is Don's mare Kate or Wakonda III, a Hanoverian mare sired by the great Werther, and the mother of Gwenael. Kate and Maui, best friends forever and ever, passed on to that grand pasture in the sky just a few years back. Marcetta used the Century Ride as her opportunity to express appreciation to all friends and family (mainly Don) who have supported her horse habit for decades. 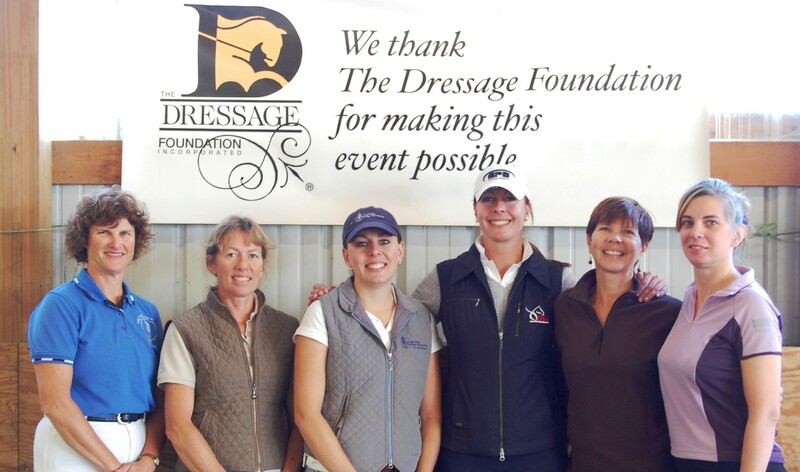 More special thanks goes to the teachers who sit on her shoulder and offer advice during her training sessions, the scores of Aggies who have worked at Look Sharp, especially Jenny Reibenspies. She thanks Donna Meyer for encouraging her to get off her duff and show off her nice horses, and do this ride. Marcetta Darensbourg is a Professor of Chemistry at Texas A&M University. She and her husband Don have bred horses, hosted dressage clinics, promoted dressage and young riders for some 45 years now, the last 35 in College Station. She is especially proud that her Century Ride was with the horse that she and Don bred, and that her equine support in the ride were of his descent.